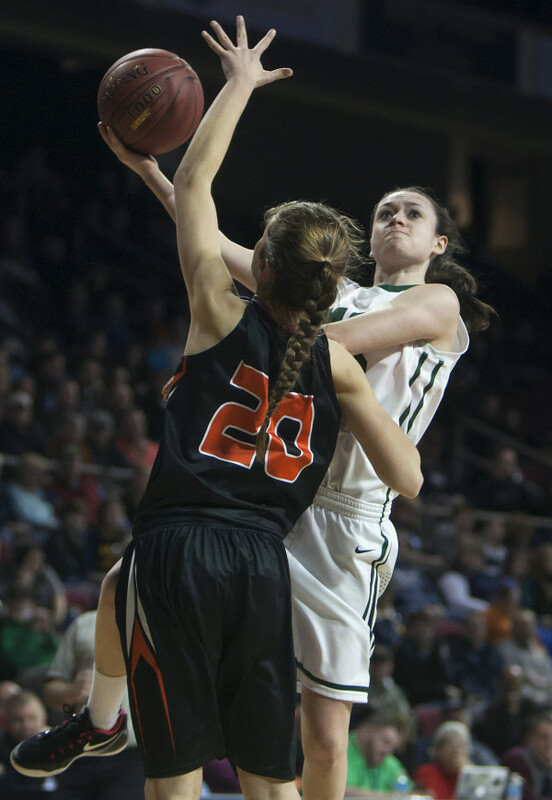 Sierra Tapley of Mount Desert Island High School in Bar Harbor, pictured shooting over Gardiner’s Mary Toman in a tournament game last February, has verbally committed to attend the University of Maine on a basketball scholarship starting in 2016. Mount Desert Island High School basketball standout Sierra Tapley, a third-team Bangor Daily News All-Maine selection this past season, has verbally committed to attend the University of Maine on a full scholarship. The 5-foot-8 guard averaged 16.3 points, three rebounds, four assists and 3.5 steals per game in leading the Trojans to an undefeated regular season in Eastern Maine Class B this past winter. They were upset by Gardiner in the quarterfinals. MDI won the Eastern Maine title two years ago. “Coming from Maine, it was a pretty easy decision,” Tapley said. “I’ve followed them since I was a little kid. I’ve gone to their games. I’ve known the players and the coaches. There has always been a community feel. “It’s comforting since I’ve gotten to know some of the players like [incoming freshman] Maddy McVicar [from Calais],” said Tapley, who also knows she will be well supported by fans from MDI and the state. She said she received scholarship offers from three Northeast-10 schools and also was talking to the Army. “But Maine called me with an offer and a little bit of a timeline. This is something I’ve wanted since I was a kid so I didn’t want to take any chances,” Tapley said. UMaine coach Richard Barron is prohibited by NCAA rules from talking about a recruit until the school has received a signed National Letter of Intent. In addition to playing for MDI, Tapley also travels to Portland with MDI teammate Kelsey Shaw to play AAU basketball for the Maine Firecrackers. From March to August, they go to Portland twice during the week for practice and also head down for games on the weekends. “I couldn’t have done this without the Firecrackers and my coaches,” Tapley said. “And she wants her teammates to get better with her,” Barker said. He said Tapley’s work ethic is second to none and her offensive game is dynamic. “She’s one of the few girls who has a jump shot. She can pull up with either hand, she can break you down off the dribble and she’s also effective from the 3-point line,” Barker said. He said Tapley will put in the time in the weight room in order to adapt to the physical play in college. And she will also work on her foot quickness. Tapley said she intends to expand the defensive aspect of her game so she can make the right reads and be in good position to defend. “I have to work on a lot of little things. I have to get my shot off a little bit quicker,” Tapley said. Maine will graduate eight players off next year’s team so there will be plenty of spots up for grabs when Tapley steps on campus. She intends to run cross country in the fall, as she did her freshman year. Her participation at UMaine is contingent upon her being accepted into the school and meeting NCAA eligibility requirements.